It looks like Chris Brown is going to need to check himself into anger management classes again after his latest incident. Seriously, this guy needs help. He cannot seem to stay out of trouble, and he is always causing some sort of drama. 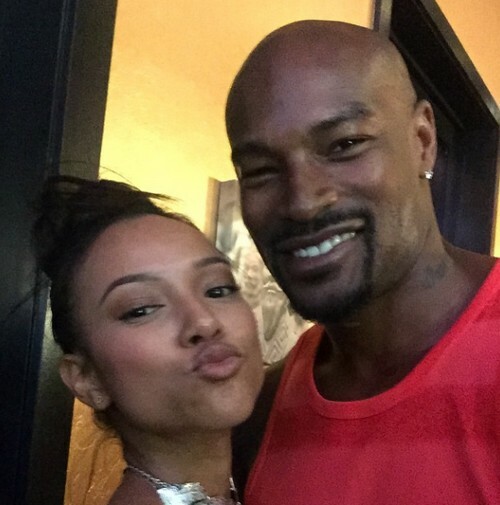 Chris Brown’s most recent incident involves him threatening to physically harm Tyson Beckfrod after Beckford was spotted spending time with Karrueche Tran. Chris Brown and his on and off again girlfriend Karrueche Tran are currently both in Las Vegas to enjoy the holiday weekend, however Tran seems to have a different idea of what she wants to do for fun, and has been spotted out and about in Vegas several times with Beckford since Friday, May 22. This is not okay with Chris Brown and the singer has taken to Twitter to release his frustrations. Throughout the weekend he has been posting subliminal messages, and then deleting them. Kid Red, one of Chris Brown’s friends also posted on social media encouraging Brown and reasserting his threats. Red said, “Memorial Day Weekend aka the n**gas will be out. We just came to party tho, unless a n**ga wanna try us…And that includes u model n**gas cough cough #TysonBeckford. We see everything LiL n**ga.” Red also included a gun emoji and tagged Beckford in the post. Chris Brown and Karrueche Tran have been an and off for quite some time, and although the couple was believed to have broken up back in March after Tran learned of Brown’s child with another woman, apparently Chris Brown still has some attachment to Karrueche, otherwise he wouldn’t be getting so jealous of this incident. What do you think? Is Chris Brown just seeking attention? Is there any good reason that Chris Brown isn’t in jail? Chris Brown Seziure 911 Shocking Medical Emergency: Refuses Treatment, Fears Drugs In His System and Probation Violation? Chris Brown Dumps Karrueche Tran So He Can Win Back Rihanna Just To Spite Drake! Chris Brown Jailed For One Month – At Least!